ITC continues to enlarge its positive carbon footprint through enhanced energy conservation, use of renewable energy sources and the expansion of carbon sequestration through large-scale Social and Farm Forestry Programmes. 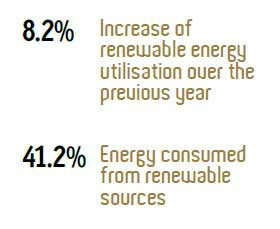 In 2012-13, ITC Units consumed 21,347 Terra Joules (TJ) of energy. Despite significant growth in almost all businesses, there has been only a slight increase of 1.0% in the total energy consumption as compared to previous year (21,130 TJ in 2011-12). This is directly attributable to the energy conservation projects implemented across the ITC Units and better capacity utilisation. Revisions in the computational methodology of energy consumption by using actual calorific values of fuels consumed (instead of default calorific values from IPCC*) together with increasing usage of renewable energy has resulted in reduction in the total primary energy computed. The computational changes were carried out as a process of standardisation for aligning with the ISO 14064:2006, the latest international standard specifying principles and requirements at the organisational level for quantification and reporting of greenhouse gas (GHG) emissions and removals, according to which ITC’s GHG inventory has been assured to a ‘reasonable level’ by Llyod’s Register Quality Assurance Limited. In 2012-13, 8,802 TJ of the total energy consumed was from renewable sources, which is an increase of 8.2% over the previous year (8,133 TJ in 2011-12). Improved utilisation of carbon neutral biofuels in the Paperboards and Specialty Papers Business and the generation from wind power projects in Maharashtra and Tamil Nadu (commissioned in 2011-12) for the full year, contributed to this increase in the share of renewable energy in ITC’s total energy consumption. Black liquor waste from pulping process and waste wood biomass from chipping operations in the Bhadrachalam Unit of our Paperboards & Specialty Papers Business. Locally sourced chip/sawdust and deoiled bran as boiler fuel in the Kovai Unit. Wind Energy farms for Packaging & Printing, Cigarettes, Hotels and Paperboards & Specialty Papers Businesses.